In some ways Luiz Zerbini’s Modernist Horizontal lives up to its title. 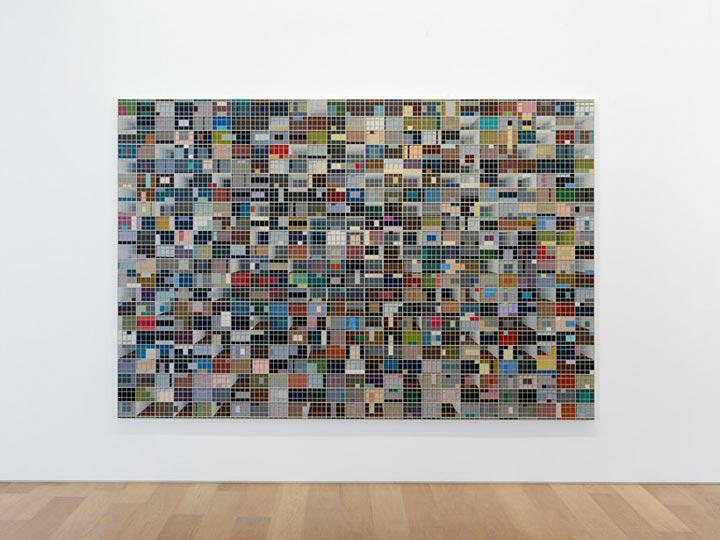 The acrylic painting is divided into a relentlessly uniform grid seemingly designed to reassert the flatness of the image; except that Zerbini makes it impossible for us to see it like that. 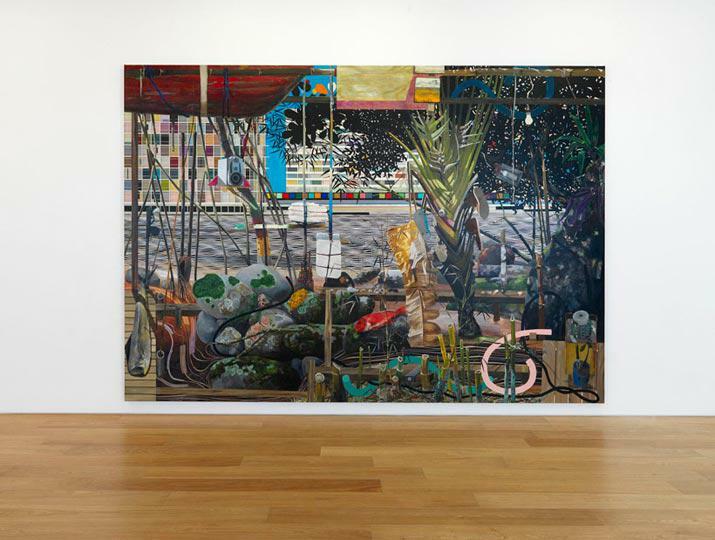 Behind the lined surface, he has painted a boxy collection of colourful larger sections, some of which are given depth and direction through the time-honoured, un-modernist tricks of perspective and illusionistic shadow. Perhaps, then, it can be seen as an obsessive take on a Bauhaus plan; except that it is too illogical a design. 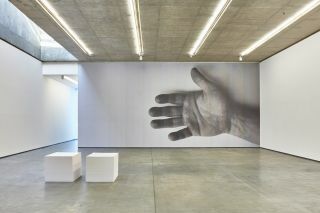 Zerbini’s ‘modernist’ image flickers in front of your eyes, restlessly switching character and defying interpretation. The grid returns in another large painting (Mamanguà Recife) on the adjoining wall, relocated and further transformed. Pushed to the back of the composition, beyond a stylised river and a foreground littered with unruly plants, flimsy wooden structures and the remnants of human activity (dead fish, machetes lodged in tree trunks, shoes hung on palms) it becomes an office block in the backwaters of a big city. Bold lines of colour reminiscent of Léger’s twentieth-century abstractions confuse themselves with hose pipes and vines. Modernism is transplanted into a messier reality. 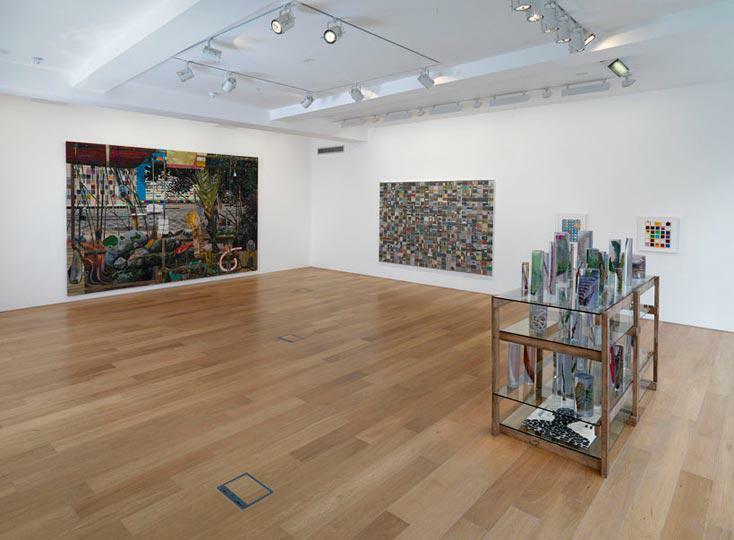 This balancing act between order and disarray underlies all of Zerbini’s work at Max Wigram Gallery. In his large-scale paintings he achieves it by uneasily combining nature and design, narrative and stasis. In a pair of collage-constructions he works instead through deliberate absences, emptying slide holders of their carefully labelled contents to create pleasing but useless patterns from the cardboard leftovers. His compositions have a sense of aimless purpose, where structures are built only to be muddled up again and overrun; we never see a figure in his paintings but we sense their (or his own) on-going, repetitive activity within them. The titular work, Every Jetson has a Flintstone inside, looks like a botany enthusiast’s cabinet of curiosities, whose transparent jars contain painted replicas of exotic leaves and bleached bones, complete with withered bits, rips, tears and discolourations. Carefully isolated and stood on end in a strange new arrangement, these are imperfect, wild forms in futuristic packaging. Why the reference to the Jetsons and Flintstones (two 1960s families from the space age and Stone Age respectively)’ Perhaps it is a hint that we are not to take the apparent clash of timelessness and modernity in his work too seriously. Both the creations of animation studio Hanna-Barbera, the two cartoons are basically the same despite living at different ends of the human timeline. Perhaps Zerbini is suggesting that, from pre-history to post-modernism, we have been painted with the same brush. However cutting edge our endeavours seem, they’re still just a part of human and wider nature. These are captivating works. 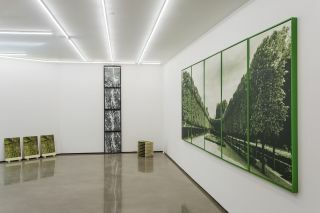 Zerbini is an excellent painter, with a developed interest in set design, photography and sculpture. 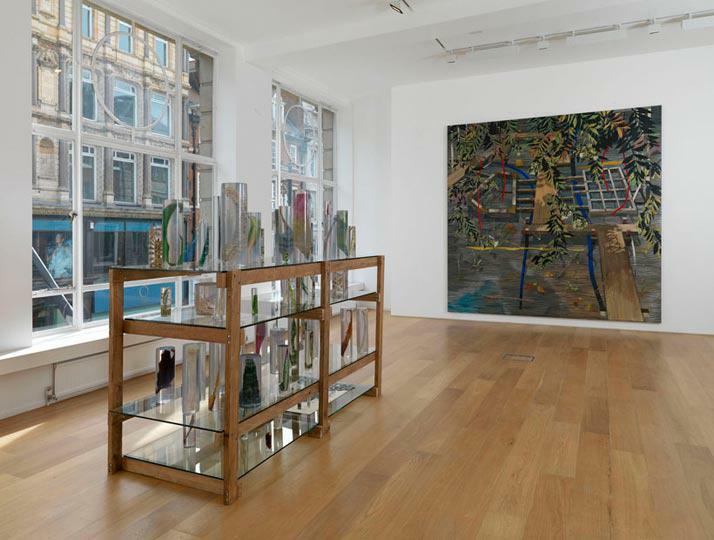 His skilful combination of large-scale composition and intricate detail, rich but subtle colour schemes and matte, iridescent and sometimes even reflective paint, results in works that are extremely compelling in the gallery space, less easy to capture on screen. 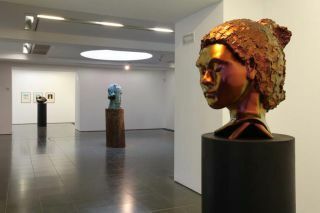 This is the first time Zerbini’s works have been shown in the UK and they are not to be missed.